Margaret Rush, ? - ? 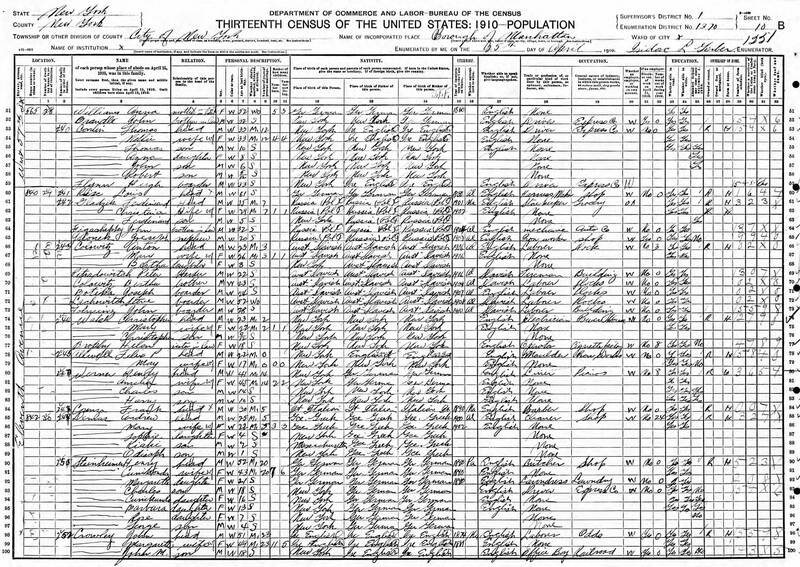 Margaret G. Steinheimer, 12 Aug 1889 – ? 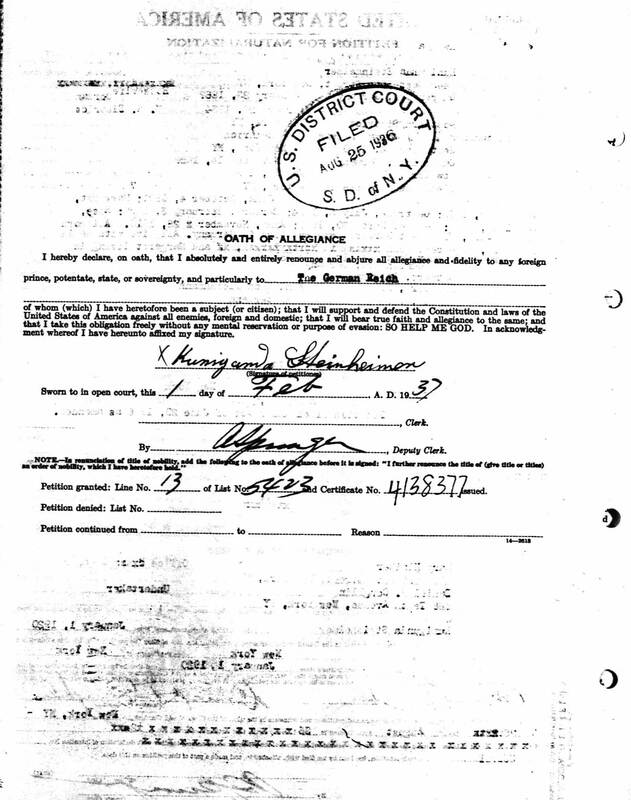 John Heinrich Steinheimer, 04 Oct 1891 – ? 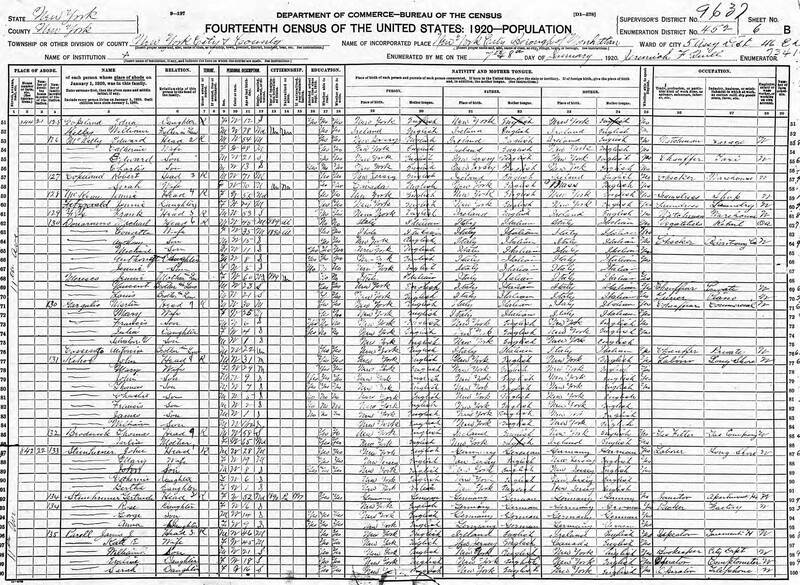 Rose Steinheimer, 13 Apr 1903 – ? 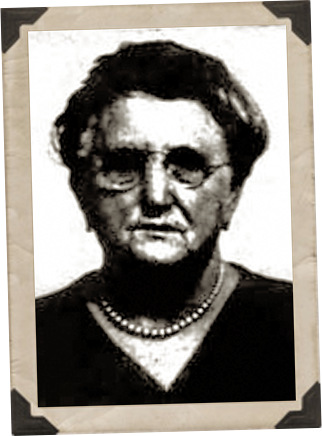 Anna M Steinheimer, 28 Nov 1910 – ? 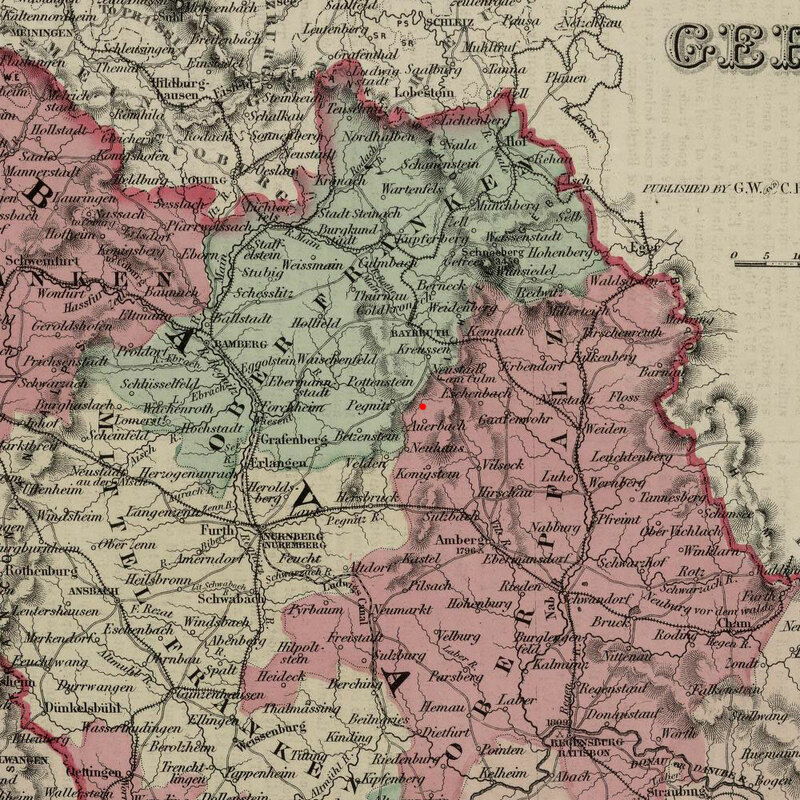 A Kuni and Heinrich were both from Gunzendorf. 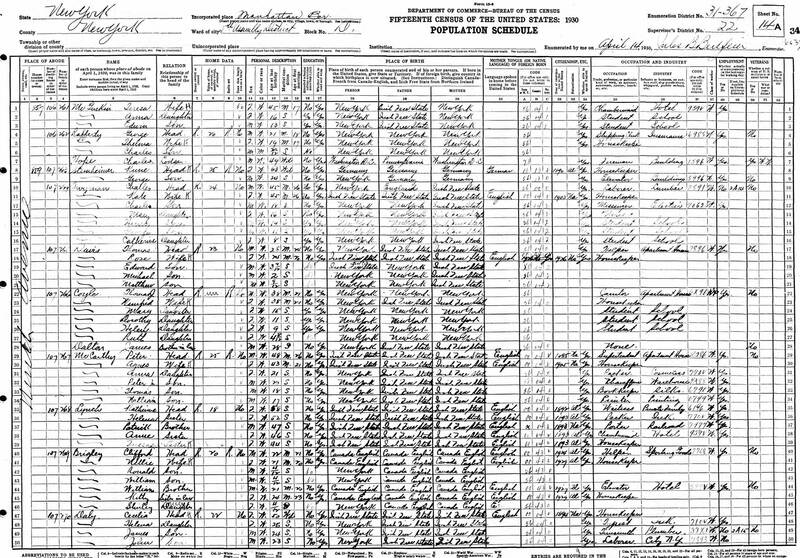 They sailed to America on the same ship, the SS Waesland, in steerage, aft, U. They had met previously because their first daughter Margaret was already 9 months old by the time they arrived in America. 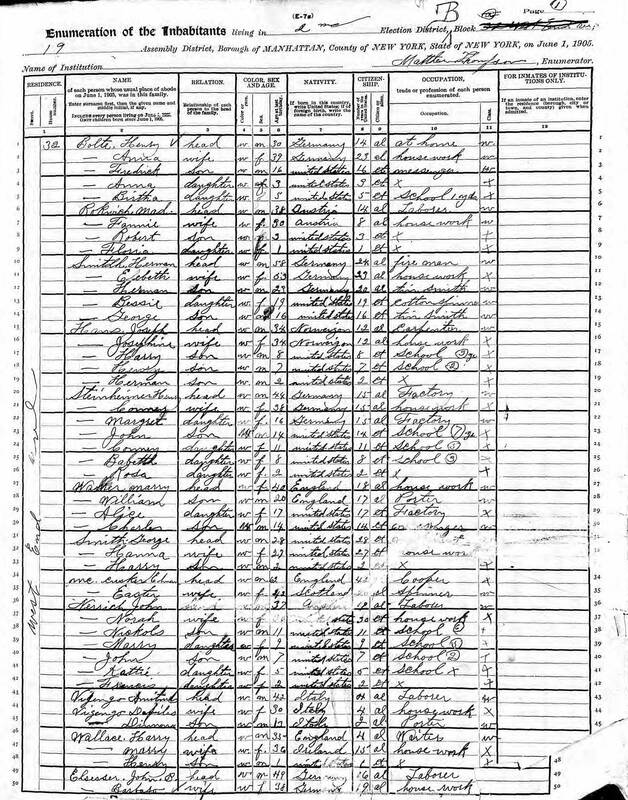 It appears they ran away together to marry in America, because they arrive separately, Heinrich as Steinheimer and Kuni as Fleischmann and would marry on 24 September 1890 in New York (per naturalization). The most interesting factor is their first child Margaret is said to have been born in Ireland (per Kuni's naturalization). 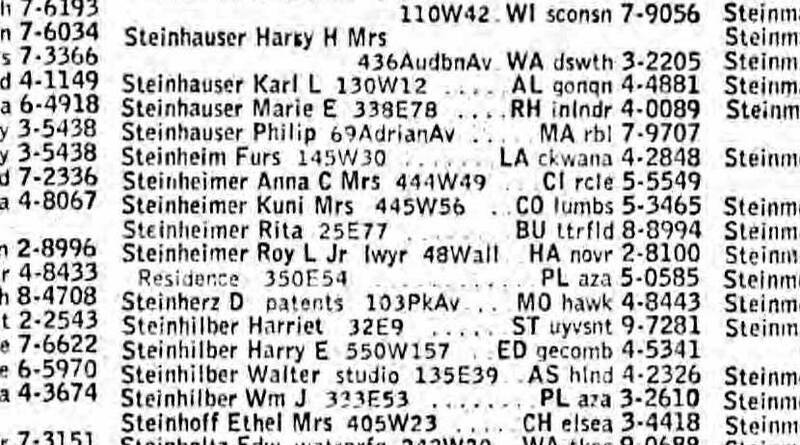 However, I believe this to be in error as neither Margaret nor Kuni ever mention this on any of their census records. 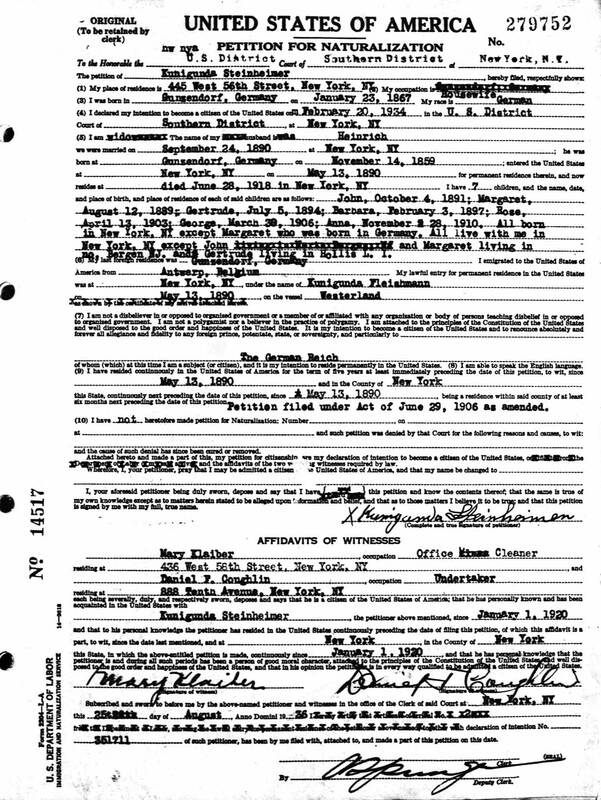 Margaret is always listed as born in Germany. 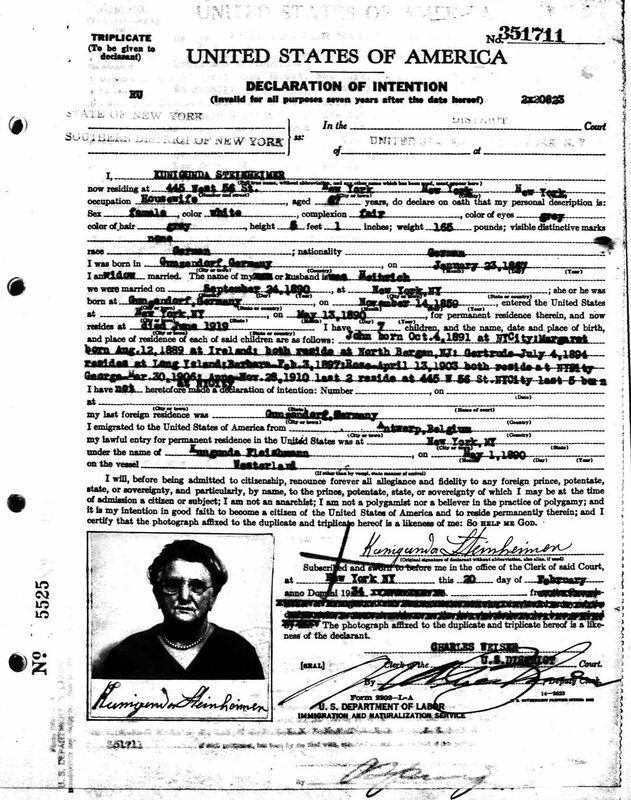 B I should also note that even though Kuni and Heinrich did not appear together on the immigration manifest, they must have traveled together. 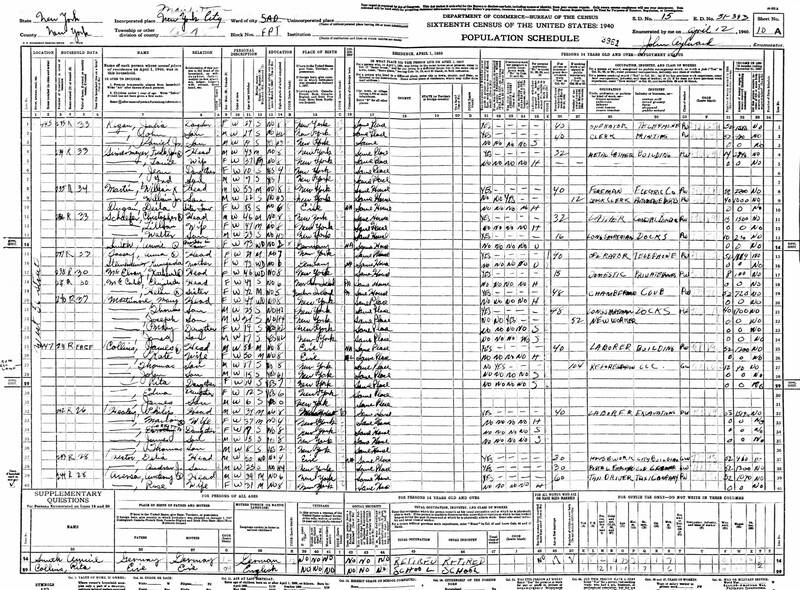 Around the turn of the century, single, unwed immigrant mothers were not allowed into the United States as the country was not keen on admitting individuals with a high likelihood to be dependent on charity and government aid. Kuni would have needed Heinrich there to vouch for her and say they were engaged and intended to marry. C Gunzendorf is one of four locations in Germany known by that name. The Gunzendorf that we're interested in is known as Gunzendorf, Auerbach in der Oberpfalz, Amberg-Sulzbach, Oberpfalz, Bavaria, Germany (49.734104, 11.610905). It is a tiny village on the east end of Germany about 70km (an hour drive) northeast of Nuremberg. 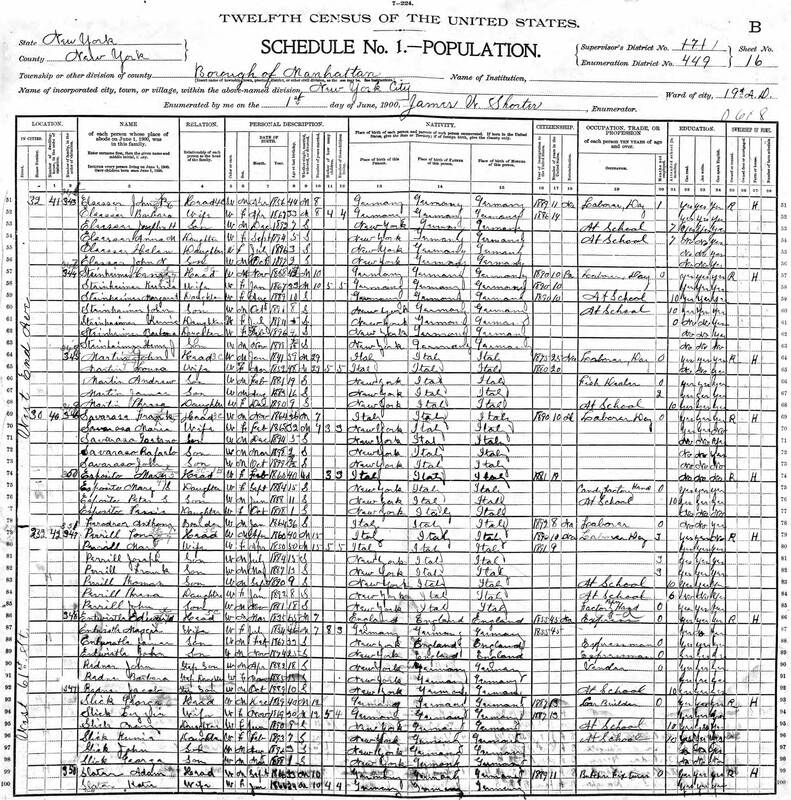 1 Death Record of Kuniganda Steinheimer - "New York, New York City Municipal Deaths, 1795-1949," database, FamilySearch (https://familysearch.org/ark:/61903/1:1:2WYS-DF1 : 20 March 2015), Kuniganda Steinheimer, 18 Dec 1945; citing Death, Manhattan, New York, New York, United States, New York Municipal Archives, New York; FHL microfilm 2,132,815. 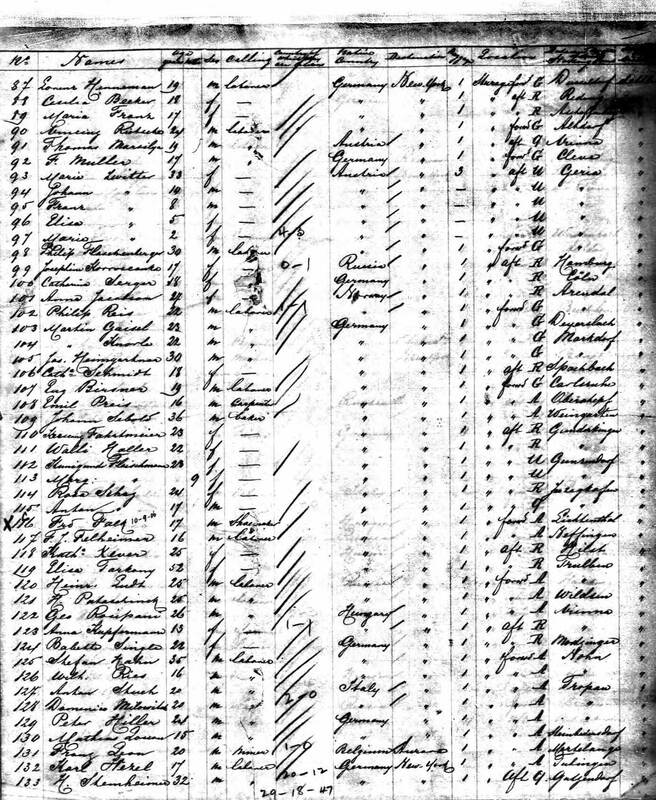 2 Death Record of Heinrich Steinheimer - "New York, New York City Municipal Deaths, 1795-1949," database, FamilySearch (https://familysearch.org/ark:/61903/1:1:2WX8-1JG : 20 March 2015), Heinrich Steinheimer in entry for Heinrich Steinheimer, 26 Feb 1902; citing Death, Manhattan, New York, New York, United States, New York Municipal Archives, New York; FHL microfilm 1,323,003.